The Brooklyn Bridge is one of the most popular of America's bridges. And, it's well used. According to the New York City Department of Transportation, "more than 120,000 vehicles, 4,000 pedestrians, and 2,600 bicyclists cross the Brooklyn Bridge every day" (as of 2016). With spectacular views of Manhattan’s skyline, the river, and the Statue of Liberty, the bridge is the place for one of the most romantic and inspiring strolls in all New York. The opening of the Brooklyn Bridge was the first of several major changes that transformed Brooklyn from a rural farming area with scattered neighborhoods into a popular Manhattan suburb. 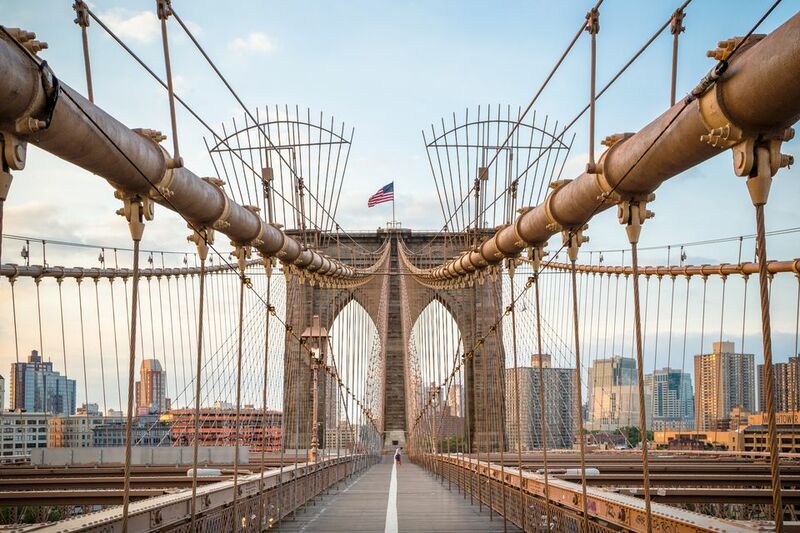 The Brooklyn Bridge is a vital part of Brooklyn's history as well as its future. Here are some fun facts about this bridge that attracts tourists and locals. The Brooklyn Bridge has always been a popular place to cross. In fact, when it opened on May 24th in 1883, many people crossed the bridge. According to History.com, "Within 24 hours, an estimated 250,000 people walked across the Brooklyn Bridge, using a broad promenade above the roadway that John Roebling designed solely for the enjoyment of pedestrians." Does the word sandhog evoke images of animals that should reside in Sedona? Well, the sandhogs weren't animals at all but were people. The term sandhog was a slang word for the workers who built the Brooklyn Bridge. Many of these immigrant workers laid granite and other tasks to complete the Brooklyn Bridge. The bridge was completed in 1883. And who the first person who walked across the bridge? It was Emily Roebling. According to American-Historama.org, the Brooklyn Bridge, the estimated total cost of the construction was $15,000,000. For fourteen years, over six hundred men worked to construct this iconic bridge. Things have certainly changed in the last hundred years. In 2016, a home at 192 Columbia Heights, overlooking the Brooklyn Heights Promenade and a short walk from the classic bridge, costs almost as much as it did to build the Brooklyn Bridge in the 1800s. This lavish home is for sale for over fourteen million dollars. In March 2006, The New York Times published an article about a secret cold war bunker found "inside the masonry foundations of the Brooklyn Bridge." The bunker was filled with over three hundred thousand crackers, medication including Dextran, which is used to treat shock, and other supplies. The fallout shelter is a product of the 1950s when the United States constructed numerous fallout shelters during the Cold War. According to the New York Times article, historians noted "find was exceptional, in part because many of the cardboard boxes of supplies were ink-stamped with two especially significant years in cold-war history: 1957, when the Soviets launched the Sputnik satellite, and 1962. ", when the Cuban missile crisis seemed to bring the world to the precipice of nuclear destruction." P.T Barnum's elephants walked across the Brooklyn Bridge in 1884. The bridge had been opened a year when twenty-one elephants, along with camels and other animals crossed the bridge. Barnum wanted to prove the bridge was safe and also wanted to promote his circus. There was once a charge to cross this historic bridge. According to American-Historama.org, "the initial charge to make the Brooklyn Bridge crossing was one penny to cross by foot, 5 cents for a horse and rider to cross and 10 cents for a horse and wagon. The price charged for farm animals were 5 cents per cow and 2 cents per hog or sheep."